When Apple first launched the iPhone in 2007, there was no App Store. 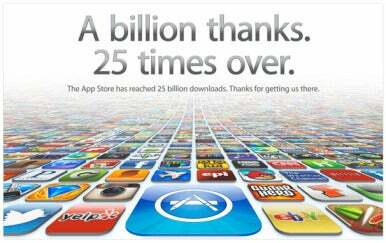 On Friday, the App Store issued its 25 billionth iOS app download. Apple announced that it had hit the milestone late Friday with a graphic on its website. On Monday, the company revealed that the app to push the download count over the top was the popular game Where’s My Water?, which as of this writing resides at number three on the top paid app list. Apple also named the winner of its 25 billion app countdown contest—and the $10,000 gift card that goes with it—as Chunli Fu of Qingdao, China. That seems appropriate, given that China has been a burgeoning market for Apple in the last couple years, with the company’s revenue in the country growing to $13 billion last year. Previous milestones saw the information-sharing app Bump push App Store downloads past the one billion mark in 2009, while Paper Glider scored the 10 billionth download a little more than a year ago. Yes, it was only 14 months ago, that iOS device owners had downloaded a measly 10 billion apps. In other words, the App Store saw 10 billion apps downloaded in its first two and a half years, and another 15 billion apps in the last 14 months. If you don’t have a calculator or iPhone nearby, those numbers indicate that, on average, more than one billion apps are downloaded from the App Store each month. And to think, late Apple CEO Steve Jobs once told developers that building Web apps was “a very sweet solution” for building iPhone software. Updated at 6:17 a.m. PT on 3/5 to add information about the contest winner.